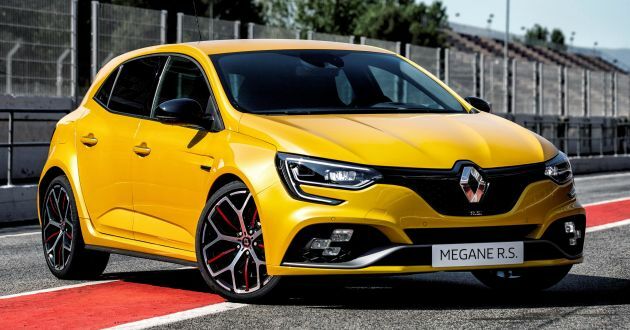 This is the new Renault Megane RS Trophy, and it is the hotter version of the French hot hatch that was first revealed back in September last year. According to the company, the car incorporates knowledge gained from Formula 1, most of which goes under the bonnet. Thanks to the use of a ceramic ball bearing system, friction in the turbocharger is reduced, which in turn leads to a better response time. The exhaust system meanwhile, receives a mechanical valve in the rear silencer to help the engine breathe and shout better depending on the selected Multi-Sense mode. Because of these tweaks, the 1.8 litre four-cylinder petrol engine now makes 299 PS, which is 20 PS more than the base Megane RS. Torque figures are also higher here too – 420 Nm with the six-speed Efficient Dual Clutch (EDC) transmission, and 400 Nm with the row-it-yourself six-speed manual. Performance-wise, the manual-equipped version will complete the 0-100 km/h sprint in 5.7 seconds (0.1 seconds less than the standard car), and tops out at 260 km/h (5 km/h more). Despite the power gains, Renault says the engine still manages to comply with the new emission control standard, Euro6d-Temp, with the addition of a particulate filter in the exhaust system. Moving away from the engine, the Megane RS Trophy comes as standard with the Cup chassis, which comes with a Torsen limited-slip differential, 25% firmer shock absorbers, 30% tighter springs and 10% stiffer anti-roll bars – these items aren’t found on the Sport chassis. Renault’s 4Control four-wheel steering systems remains in place here. The use of bi-material front brake discs help trim unsprung mass by 1.8 kg per wheel, while red-painted Brembo calipers are a distinctive feature. Also standard are 19-inch ‘Jerez’ wheels wrapped with Bridgestone Potenza S001 tyres, or optional 19-inch ‘Fuji Light’ wheels that are 2 kg later per wheel and come with Potenza S007 tyres. While those sticky tyres help to keep the car on the road, optional, 20 mm-lower Recaro sports seats upholstered in Alcantara ensure you are held in place. In other news, the Megane RS Trophy gets an iconic body colour, Liquid Yellow, along with Trophy stripes on the F1-style blade. With the hot hatch wars well and truly underway, which one holds your fancy? The FK8 Honda Civic Type R, Ford Focus RS, Hyundai i30 N, Volkswagen Golf R, Peugeot 308 GTi, or this? The Megane RS was the 1st genuine Hot Hatch to challenge the Mighty VW GTi. Fast forward now, this Megane RS with just 1.8 liter is gunning for its throat. If VW is not careful, Renault will steal its title under their nose so VW better watch out. Hot hatch crown already belongs to civic coupe type-r turbo since many moons ago. Evo magazine uk claimed that the i30n was way better than the megane rs 2017. Cant wait how this new rs fares against the i30n. eew. edc . tak nak.